Travel Dates are September 2-25 2013! 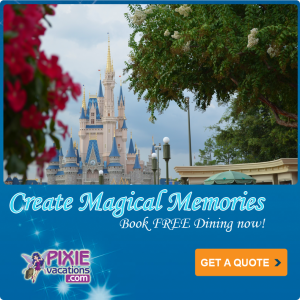 When you book a Disney Vacation of at least 3 days and including 2 day base tickets you will receive the Disney Dining Plan at all Moderate and Deluxe Resorts or the Quick Service Dining Plan at most value resorts for FREE! If those dates do not work…why not take advantage of the room only offer! Book now for stays 8/15/13-9/28/13 to receive up to 30% off of your accommodations! Either way you can still get FREE money with your new booking! Simply contact me to get a gift card when you book your Disney Vacation me! You will never pay more than booking directly with Disney, but you will get concierge level service and many magical extras! Simply click on the image above to get a free quote! This entry was posted in Deals and Discounts, Dining plan, Discounts, Uncategorized and tagged Free dining, Gift Card, room discount. Bookmark the permalink.